There is definitely no such thing as a free lunch. Where I work, the pork pies are one of the favourite features of a working lunch. I'm really fussy when it comes to pork pies and will only eat them if they don't have jelly in them. In some ways that's good because it stops me from eating them too often. I only really like the pastry bit but when in polite company, it's not really the done thing to hoick out the pink (or more often grey) nugget of 'pork'* and scrape out the jelly bit. But the work pork pies are pretty good. Pink meat*. Crusty-ish pastry. No jelly. So of course I had one. Or a half anyway. My boss kindly showed his chivalrous side and let me have the only diet Coke to make up for a less than healthy lunch. But even that did little to negate the impact of my poor lunch options and my need for a consolatory Flake in the late afternoon. Hence why I ended up with a super-healthy fish dinner tonight. I wrote yesterday that I'm still having trouble letting go of the Olympic Food Challenge. Three days on, and I was really tempted to do another foreign recipe, but I ended up saving the Chimmichurri Steak (inspired by our esteemed OFC Coach Ewan**) for tomorrow night and cooking a country-agnostic fish dish instead. 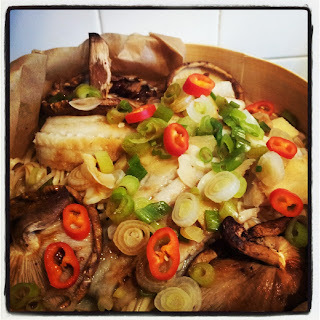 Overdid the veg - the fish and noodles are in there somewhere! The dish is pretty simple in that you just pop everything into the steamer for ten minutes, and hey presto healthy, tasty, low fat dinner for one. The downside is that it is a pretty expensive dish what with the mushrooms, ginger, chillis etc which you can generally only buy in multiples and not in quantities for one - so something that you would possibly only afford once in a while. It does use Pollack however which is pretty cheap in the fish stakes (no pun intended!). I still have my head very firmly buried in the sand about just how much I've spent in this past year buying food I wouldn't normally buy just to complete this 'challenge'. That point has actually given me some inspiration for my future ramblings over on my new blog which will be coming online in October. I'll also be doing a bit of guest blogging elsewhere - more on that shortly. In the meantime, I'm thinking about how to best let go of this blog. I'd like to do so with some input from the lovely people who've taken the time to read my blog. At the moment, I've had just over 35,000 page views since started. This has blown me away and so I feel I should draw a definite line at the end of the year and celebrate the finish. So I'd like to invite anyone who has read this to ask me a question about the blog. If you visit 'The Last Post' page and leave a comment then I'll do one final post after 26th September (day 366) where I'll answer them all. 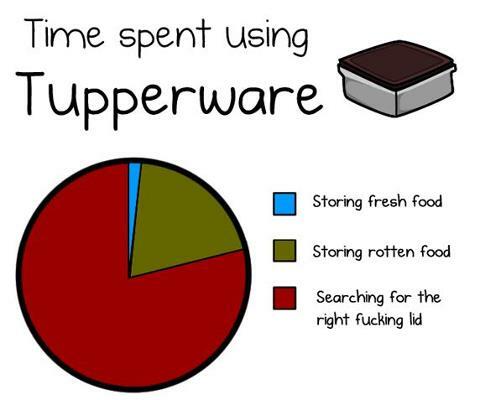 PS In lieu of me posting a flag today, I'll leave you with this cartoon I pilfered from FaceAche on the subject of Tupperware. This sums up my relationship with plastic boxes perfectly.